One of the simplest fused glass items to make has got to be simple round glass cabochons. Well, that’s what I thought, but there is a catch, or two. 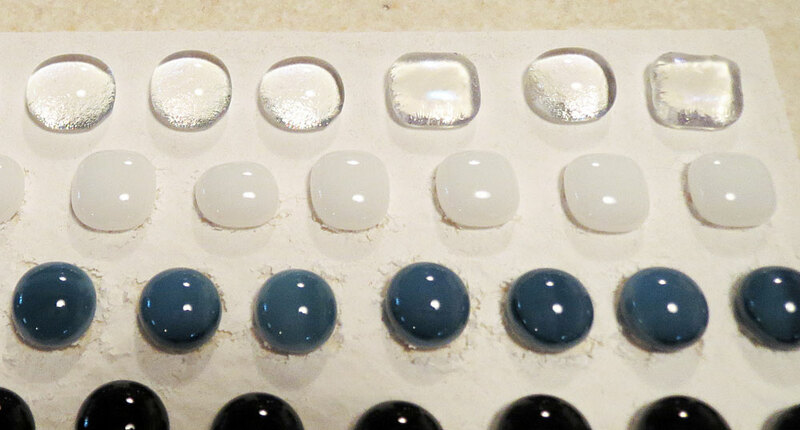 Small round cabochons are great for making things like stud earrings and for embellishing other creations. In the past I have successfully made these without any real problem, using transparent glass. But now I wanted to make some using opalescent glass. My research told me that Bullseye opalescent glass does have a tendency to pick up shelf separator and paper if fired at a high temp, such as a full fuse. But I had to try. Eager to make a bunch of these little cabochons I set about cutting a stack of 10mm square pieces from 3mm transparent and opalescent Busllseye COE 90 glass. This is a task in itself; repetitively cutting strips and then cutting them into little squares. Note to myself, look for a better way. 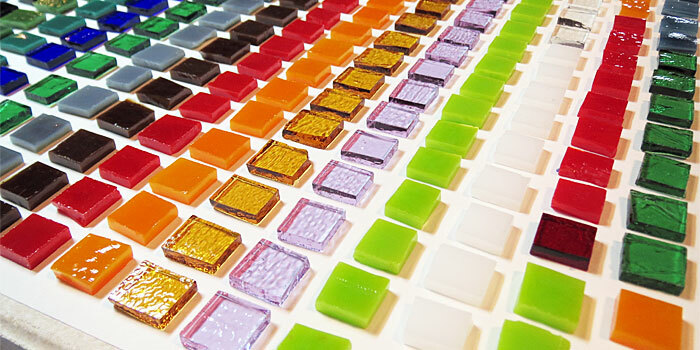 The cabs can be made from a single piece of 3mm glass. Surface tension in the glass will pull the square up into a small round cab once process temperature is reached. Well, some time later this is the result. 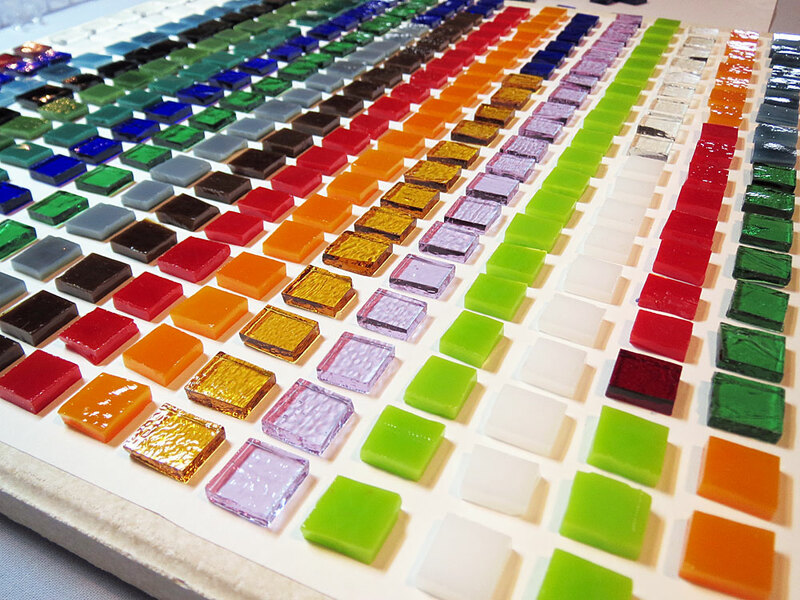 A kiln shelf full of little squares of glass. If you are wondering how I lined them all up, here is the trick. Simply place all your squares across the shelf as equally spaced as you can, in a sort of line. Then take something nice and straight, like a ruler, carefully lower it close to the shelf and below the squares, then push the ruler up collecting all the squares and keep pushing until they all line up close the to previous line. Easy! Into the kiln they went on a full fuse schedule. They were fired on Thin Fire kiln paper as this worked previously. The firing schedule is included below. Some hours later when I opened the kiln everything looked great. 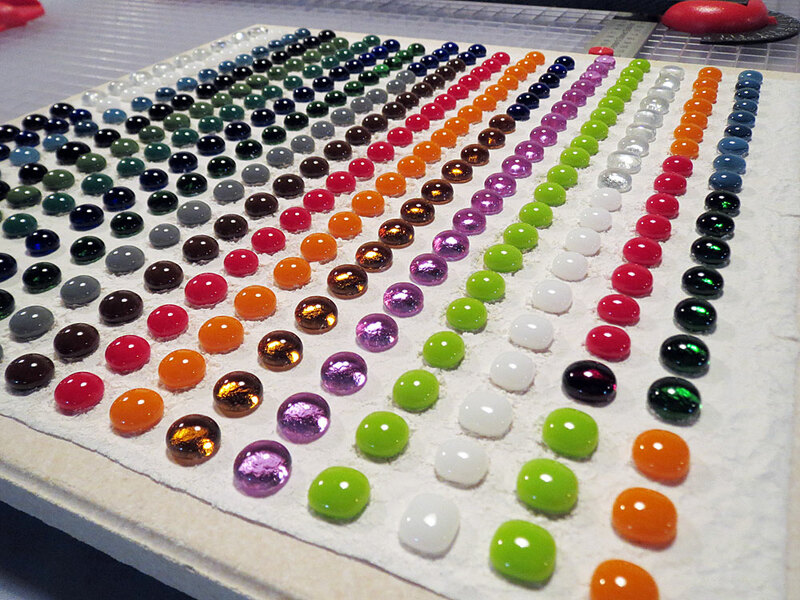 All those nice little cabochons lined up looking nicely rounded and shiny. Then I looked a little closer. You can see that some of the white and iridised clear had not rounded fully. They were still a little square in shape, though otherwise formed well. Another thing I noticed is that these were mainly near the corners of the shelf, as you can see the corner of the Thin Fire paper in one of the photos. On close examination I realised that a number of cabochons near the corners had not rounded, especially the white and iridised clear. My assumption is that the corners of the kiln are cooler spots of the kiln and while other colours did round okay, the colours that required a little more processing did not have time to fuse completely and round off. Next I removed the cabochons from the shelf and cleaned them up. Then I found the next problem. All, and I mean all, of the opalescent cabochons had picked up the Thin Fire kiln paper, while the transparents were clean. I did manage to clean this off, for the most part, but it still left a nasty scummy bottom to the cabs. The thought of then sanding or grinding all of these and then fire polishing them again was just too much to bear at the time, so I simply put them aside until I could find a solution. Some discussion in a forum suggested that I process at a lower temp and for a little longer, and because I am using Thin Fire paper maybe I should vent up to 500 C.
My kiln does have cool spots, namely the corners, that I have to consider when firing. Opalescent glass will pick up shelf paper and kiln wash. Some colours need more processing to form the nice round shape.